Ramappa Temple is a Shivalay temple (where lord Shiv is worshiped) situated 77 km from city Warangal and is also known as "Ramalingeswara Temple", but former name is more adopted and is popular. The name it got is from the sculptor Ramappa, a Vishwakarma Brahmin Sthapathi of Karnataka State who built this, in the auspices of Rechlera Rudra a General Kakati Genapati Deva king and probably is the first temple in India which is named after an sculptor rather then the deity it was built for. History says it took around 40 years to build this temple (just double of what it took to build Taj Mahal), well this no of years is not surprising as the intricate carving and beautifully structured is a testimony to this much effort. Some of the damages it received are due to 17th century earth quake and some of the idols ("Navgrah") were seen missing, may be stolen. I started from Hanamkonda bus station, we don't have direct bus from Warangal to this temple, from the bus station you have to reach a place called "Mulug" (buses are available easily), from there change the bus to "Palampet". You can take a auto rickshaw as well from here. The bus will drop you at the point where a separate road is built towards this temple (the pic shown on right is the gateway road to this temple), basically its small village crossing which will lead you to this temple (from road its just 1.5 km). It's a 2 hour journey from the Hanamkonda bus station but believe me you will regret if you miss to visit this temple. The temple is well bordered with stone wall originally built at that time. I find this temple ground to be little lower then the outside ground. As shown in pic (first pic) temple is standing on platform which is around 6 feet in height from the ground and looks like favorite style of building temple by Kakatiya dynasty (The Thousand Pillar temple is raised from the ground level in similar fashion). This is built in star shaped when looked from the sky. There is no entrance fee but they do charge for video (photo shoot is free). It is said that the roof (Garbhalayam) of the temple is build from the stone which is so light that it can float on the water. This main Shiva temple has two sub structures on both side of it, on one side is smaller Shiva temple (pic on right) and other is the conference hall (ruined). I hired a local guide (for Rs 50) and as per him the side Shiva temple was built first as a model, though this temple is currently not worshiped and wasn't cleaned hopefully since its inception. Inside the temple is no conventional Shiv Linga but a stone in oval shape is placed (not sure whether it had Shiva Linga before and later replaced with this). 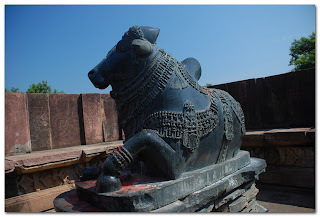 Nandi idol within this temple is little damaged on the face part. Just in front of this temple is tall stone mounted (see pic on left) with an inscription in Telugu and Kanada about this temple. It is in that which states that this is built in 123 AD along with the details of Ganapati Deva king. The wall of this temple very much resembles the wall of Thousand Pillar temple, instead of giving single stone look it is carved to give a look of multiple pillar stitched together to form a wall. The main Shiva temple has three entrance the one shown on the right is the front entrance, behind me is the Nandi Idol. In all the three entrances you will be greeted by two elephants sculpture in sitting posture, though none of them are in complete shape. Just outside the main entrance you can see the two Vinayak Idol (Lord Ganesh) placed in two sides of it (the one is currently being washed by that lady). The Shiv Linga inside is of life size and continuous prayers are still being offered. The center (inside) this temple is occupied by four tall pillars carved out of 5 stones staked one above the other and each stake is sculptured magnificently with precision. Each of the pillars has different sculpture from others and center of this pillar is held by platform meant for Nrityangana (Classical Dancer) who performs dance before the lord. The roof (from inside, exactly above this dance platform) is inscribed with Netrazan idol (other avatar of lord Shiva). The platform thing can be seen in the Warangal Fort as well (See my blog "Warangal Fort"). On both sides of the door where Shiv Linga is placed, there is a inscription of 30 small sculpture depicting various pose of Mridang Player each of the 30 inscriptions are different from each other (shown in the pic on left). Take a close look in this picture on the right, the right most female sculpture who is holding a banana tree in her left hand, on top of that tree is carve of Lord Krishna playing a flute in standing position, the interesting thing is the banana tree which is not a hollow and is carved out of single stone emits different sound when hit by finger in different point. As usual any Shiva temple is incomplete without a Nandi, in front of this gate is a gigantic Nandi Idol beautifully carved out of single stone and unique in style in the sense that it has got its own temple like structure, raised on a platform of the same height as of this main Shiva temple. The stone walls surrounding this Nandi is beautifully carved and as you can see in one section of this wall is a series of elephants engraved, in fact most of the temples built in this dynasty, you would see such a series of elephants, horses, swans, dancing women etc. Close look in right pic you can see a full human size sculpt figure in various pose attached in each of the supporting pillars of the temple. These are one of the prime attraction of this temple and each one of those sculpt has got a name and some story. There are total of 12 such sculptures and all are different from each other, one among them is the smallest in height (first one, the one on the rightest side of this main entrance) and one is the tallest (the last one, is on the other entrance). All sculptures has received some damages and only one which is the tallest of all is in complete shape. Circulating the temple wall is a series of elephant sculpture engraved onto it, there are around 512 or 412 (don't remember) of such elephants and each one of them is different from other in terms of shape or pose. This style is typically seems to be favorite of this dynasty as the same pattern is found in other structures/temples like Thousand Pillar and in Warangle Fort where elephants and the lions are being mostly used (See my "Warangal Fort" blog for such series). Outside wall of this temple has a wall mount structure as shown on the right pic belonging to "Navgrah" (9 Planet Lord, in Hindu religion each planet is worshiped as lord), though each of them is missing the idol there are only 3 such mounts but each holds the 3 compartments as you can see in the pic and I believe each such mount is occupied by 3 planet lords in respective compartments. All together a must see temple if you visit Warangal. let me know whether planning to Ramappa Temple and Lake at this season / time by car is OKAY or not. Can we expect some water fun / swimming at Lake. I have visited 7 places. Ramappa temple stands the best one of all. Really one of the beautiful stone carvings i have seen. Must see this temple who ever visits Warangal. Sad part is that Government should have maintained it properly to restore it.